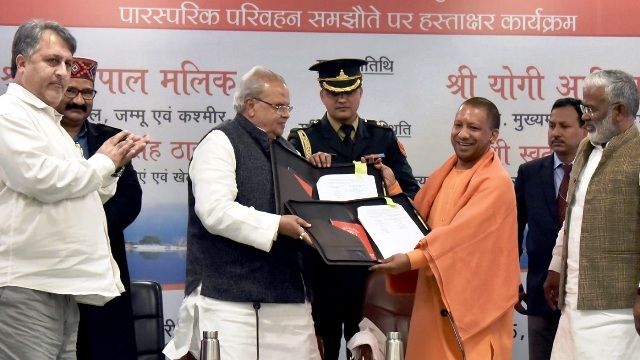 Jammu,January 07 (Scoop News)-A Reciprocal Transport Agreement between the Governments of Jammu and Kashmir and Uttar Pradesh was signed in presence of Governor Satya Pal Malik and Chief Minister of Uttar Pradesh Sh. Yogi Adityanath today in Lucknow. Sh. Swatantra Dev Singh, Transport Minister of Uttar Pradesh and Sh. Govind Singh Thakur, Transport Minister of Himachal Pradesh were present on the occasion. Principal Secretary Transport, J&K, Dr. Asgar Hassan Samoon and Principal Secretary Transport, Uttar Pradesh, Ms. Aradhana Shukla, signed the Agreement on behalf of Government of J&K and Govt. of Uttar Pradesh, respectively. This Agreement has been signed to facilitate operation of Road Transport Corporation Buses of both the States in each other’s territories. Emphasising the significance of strengthening transport facilities between the states, Governor observed that movement of people and goods between regions acts as an integrating factor which helps in broadening understanding between people belonging to diverse cultures and strengthening economic bonds between them. Observing that signing of this Agreement will cater to the rising demand and provision of better transport facility to people of both the States, Governor described it as a significant step towards boosting the economy, and for facilitating students studying in educational institutions of both the States and the intending pilgrims to the Holy Shrine of Shri Mata Vaishno Devi in Katra. As per the Agreement, initially six buses of each State shall operate whereby JKSRTC will cover the three routes of Jammu-Lucknow via Delhi Kanpur; Jammu-Aligarh via ISBT /Kashmiri Gate, ISBT Sarai Kaley Khan, New Delhi-Yamuna Expressway and Jammu-Agra via ISBT/ Kashmiri Gate, ISBT Sarai Kaley Khan, New Delhi-Yamuna Expressway. UPSRTC will operate on Mathura-Delhi-Katra (via Yamuna Expressway); Saharanpur-Ambala-Jalandhar-Pathankot-Jammu-Katra and Muzzafarnagar-Haridwar-Jammu-Katra.